← A bounty hunter and a very very good actor! 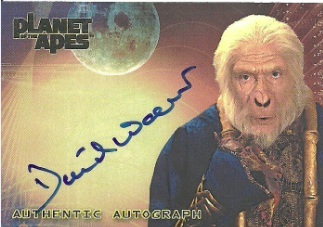 David Warner was the voice of Ras Ah Ghul in the Batman Animated series. Asides from voicing one of the coolest villains ever he had roles in the original Tron, Titanic. The Omen, Planet of the Apes, The animated voice of the Red Skull, a role on Twin Peaks and Star Trek. I’m pretty sure that qualifies as a pretty awesome pickup. Natasha Lyonne is best known for playing the hottie Jessica on the American Pie movies. I always loved her character, and was sad to see she never had a bigger hollywood career. She also was in the Movie Slums of Beverly Hills. She’s a pretty rare signer, so I was pleased to pick up these signed notes from her.